If you’re not a drummer, but you need drum tracks for your productions — and assuming you don’t have the budget and facilities to hire and record a real drummer — you’re going to need to use either MIDI drums or audio drum loops to create your drum parts. Having used both extensively, I thought it would be helpful to present some of the pros and cons of these two ways to create drum tracks. Commercial drum loops offer you quality recordings of a real drummer playing, so they’re a good way to add realistic and professionally produced drum tracks into your recordings. 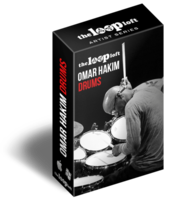 There are countless drum loop collections available, many offering full song sets that include the basic groove, variations, intros, endings, and fills. 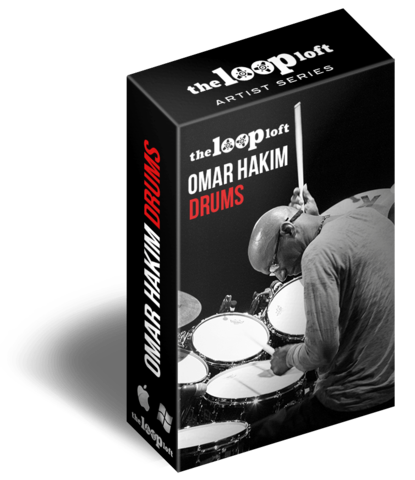 You can find drum loops in styles ranging from hip-hop to rock to country to singer-songwriter folk and more; and even collections played by famous drummers. With drum loops, you don’t have to worry about compression and EQ (unless you want to change the sound for creative purposes), because they’ve already been professionally mixed. Once you get your loop track constructed, just hit play. Since they’re audio recordings, drum loops come at specific tempos, but most DAWs can time-stretch them to match the tempo of your song, and as long as it's not too far from the original tempo of the loops, they should sound fine. A well-produced loop set will provide you plenty of choices, and you can drag the ones you want into an audio track in your song. Some drum loop sets are also available in a multitrack format, and such products offer you a lot more mixing flexibility, if you don't mind mixing them yourself. Audio drum loops are more expensive than MIDI loops. Typically, you have to spend between $50 and $90 to purchase a collection of stereo loops (a lot more for a multitrack set), which will typically have 20 to 30 different songs in it, each containing numerous loops. Although audio loops typically sound great on their own, the engineer who mixed them obviously had no idea what your song was going to sound like, so sometimes the mixes won't be quite right for your purposes. Since you're dealing with stereo loops, the only way to alter levels of individual drums within them is by using EQ to boost or cut in a narrow enough frequency range to affect mostly the drum in question (which isn't always possible), or by using multiband compression to accomplish a similar result. Unfortunately, processing a stereo drum loop like that can compromise its overall sonic balance. Another drawback with drum loops is that if your song has some particular variations in the arrangement, say in certain measures the kick drum is anticipating the downbeat by a sixteenth note, you’ll probably have to edit the loop to make it fit. Whether your edit will work or not depends on if the drum hit your moving is "in the clear" at the point you edit it. If another drum or cymbal is ringing over that spot, your edit will likely sound unnatural. MIDI gives you ultimate flexibility with drum parts, because it’s totally editable. You can change drum kits in your virtual drum instrument, slide notes from one drum to another or backwards and forwards in time, change velocity, quantize and so forth. 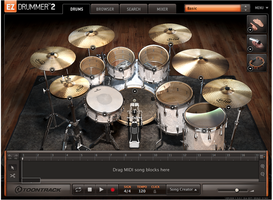 MIDI drum loops are also available commercially, and many are MIDI recordings of actual drummers, giving them an authentic feel. You can play in your MIDI parts from a controller keyboard, pad controller, or MIDI drum kit. 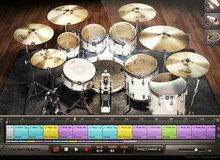 What's more, if you want to do a multitrack mix, you can pretty easily split a MIDI drum part into separate tracks for the kick, snare, overheads, etc.Many virtual drum software titles, such as Toontrack EZDrummer 2 or Native Instruments Studio Drummer (among many others) allow you to create drum parts from built-in libraries of grooves and fills, and you can drag the finished track right into your DAW. Putting together a drum part that way is simple and relatively fast, and, as with any MIDI drum part, you can experiment with different sounding kits and use the plug-in's internal mixer and effects to balance and alter the sound. If you’re planning on tapping in the beats for your drum part using your MIDI keyboard or even pad controller, you may find that it’s extremely difficult to sound like a real drummer that way. It’s okay for music in which the drums are heavily quantized, but if you want it to sound authentic, you’re most likely going to need commercial MIDI loops played by a real drummer, or auto-drummer software. It's very difficult to simulate the subtleties, ghost notes, dynamics and rhythmic techniques of a real drummer when you’re trying to “play in” your MIDI parts from your keyboard. What’s more, even with great sounding drum instruments like FXpansion’s BFD and Toontrack Superior Drummer, and commercially released MIDI loops recorded from a real drummer, it never seems quite the same sonically as a multitrack recording of a real drummer. As you can see, there are pros and cons to both approaches. Deciding which is best for you depends a lot on your workflow, what kind of music you tend to produce, and sometimes, what types of loops are available for that style. I’m not advocating that you use one or the other exclusively, but it’s helpful to know what each has to offer and what their limitations are. The table below shows a comparison of key attributes for the two approaches.